The Japan Prize 2014 International Contest for Educational Media hosted by NHK was held in Tokyo from October 15 to 21, and in the Proposal Division, “Meerkat’s Adventure” by Namibian Broadcasting Corporation (NBC) , Namibia, won the Hoso Bunka Foundation Prize as the most outstanding proposal for a TV program. The purpose of the Proposal Division is to honor outstanding proposals for TV programs, created by broadcasters and producers of countries/regions with limited budgets and technical facilities, and to support the realization of ideas to make a complete show. This year’s five finalists, selected in advance from 43 entries from 32 organizations of 17 countries/regions, were all required to come to Tokyo during the Japan Prize period and present their proposals in front of the jurors for final selection. As the result, “Meerkat’s Adventure” won the HBF prize as the best proposal. 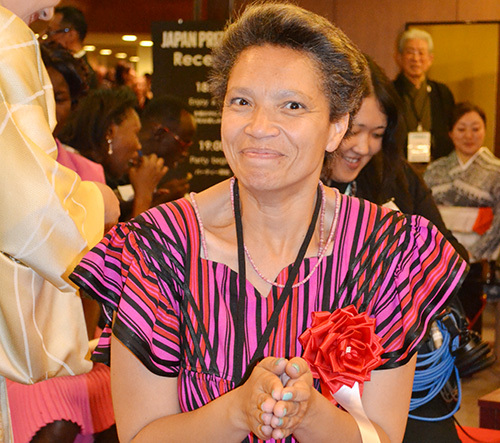 Ms. Glynis Beukes-Kapa, TV producer of NBC who made the presentation, was awarded the trophy and the $8,000 prize money by Mr. Hiroshi Shiono, President of the HBF at the awards ceremony held on October 21. The award-winning proposed show, “Meerkat’s Adventure” is an educational animation that provides preschool children with an opportunity to be exposed to English, through a story of an adventurous Meerkat that travels deserts, savannahs and coastal areas around Africa to meet various animals. --What made you decide to produce an English educational program for children? English is the official language in Namibia, but thirteen languages are spoken in rural districts. So when children enter primary school, all of a sudden, they have to take classes all in English. My sister who teaches early elementary school kids tells me every year that it’s really tough for the six-year-olds. As a TV producer, I thought I could do something about it. Also, I have four children myself, 3, 6, 11, and 15 year-olds. I always wish to produce programs that they think interesting and consider what they like. --Why did you pick a Meerkat as the main character of the show? Meerkats inhabit in dry areas of southern Africa and are very popular among kids in Namibia. This small animal is continuously very active and look positive to learn. For these reasons, I thought a meerkat is apposite for this show. Namibia is very dry all year long with only about two months of rainy period, and even in the capital, I sometimes see a meerkat when I wake up in the morning. --What kind of style does the show have? It’s a 26-minute animation that children love. Actually, one of the reasons I came to Japan is because I want to learn about animation production. We are not good at animations, so I hope I’ll get some advice here in Japan. Japanese animations are very good, and my kids love “Naruto” and “BLEACH”. So the animation with the meerkat character will make a very fun TV program for kids. --Specifically, what would you like children to learn from your program? First, I want them to learn basic things like alphabet, numbers, colors and shapes in English. For example, we can use animals to teach English alphabet. Instead of saying “A for Apple,” we could say “A for Aardvark” or other animals like mongoose and meerkats. So kids can relate the animals they know to the alphabet they learn. Also, as kids come from various cultural groups, we want them to learn basic etiquettes in English. For example, when you take a toy, you must say, “Please” or “Thank you”. By doing so, I believe that the kids will be able to learn how to express their emotions such as “happy” or “sad”, and then talk with each other in English. --What are the broadcasting and other plans for the show? We are considering three media. First, we plan to broadcast the program on NBC’s TV channel between 2~3PM, the airtime for the kids of that age group. We also utilize radio broadcasting because radio waves reach anywhere in the country, and NBC Radio has good language programs. And then we’ll do DVDs and deliver them to areas such as small villages where TV broadcast cannot be reached, so that the teachers can use the DVDs in addition to the radio broadcasting. --Would tell us about your professional background? Before working on TV, I was involved with film production as a freelance production manager. I supported Hollywood film shootings that were carried out in the Namib desert once or twice a year. But wishing to do a job more valuable for children including my own, I joined NBC in 2009. As I studied political science in college, my first work was political documentary production, through which I conveyed to viewers what political and social issues were or whether our government was doing a good job. Then I had an opportunity to take training at the educational division of a Swedish television for two weeks. When I got involved with producing programs for children there, I thought, “This is what I love”. That’s how I started producing educational programs. However, as we are a very small team, we cannot cover all the age groups at once. So we started with the age group 6~12, then produced programs for a higher age group 18~25 useful to get a job or start a business. Then this year, we started a show for teenagers especially between 13~15, so they can talk about issues they face. And now, it’s time for us to start a program for the age group 3~5 year-olds. As we can’t do everything at once, we know the program can be sustainable only when we have everything in place including sponsorship. --Prior to the presentation, you participated in a workshop with other finalists. How did you get inspired by other people’s presentations? The day before the presentation, we had an opportunity to sit and listen to other participants’ rehearsals with each other. While worrying if your project goes all right, although you know it’s important, when you listen to other participants, you think maybe my problem is not that important. The child in Nepal suffering poverty, the kids of the Philippines living in the areas which remain flooded all year long, and the kids in Bosnia trying to get connection with the nature, each of the stories is very important. And teaching the pre-colonial African history that kids don’t know is also important. I was very inspired by other participants. I tried to see their work and interact with them. They were all friends, rather than competitors. --What advice did you get from the workshop instructors? Was your presentation changed by their advice? He said my presentation speed was very good, BUT, always but comes after that, he encouraged me to re-look at my work saying “Have you thought about it this way?” or “Have you thought of trying this?”. Not saying you will do it, he gave us suggestions saying “If you try to do this way or that way, it might get better. Think about it. It’s up to you”. Their suggestions were very important for all the participants. The whole composition of my presentation slides are the same, but taking their suggestions, I started my presentation with the Meerkat, taking it from the end and putting it at the beginning, so that would tell people more about the program. They gave me good suggestions saying “Show people why you came to Japan, what you want to do , and why you want the support money at home. They can understand. When they understand what you need, then they’re convinced that your course is good”. Their words were a big help. --And you convinced the jurors successfully. Congratulations again. We are looking forward to the completion of your program. Thank you very much.